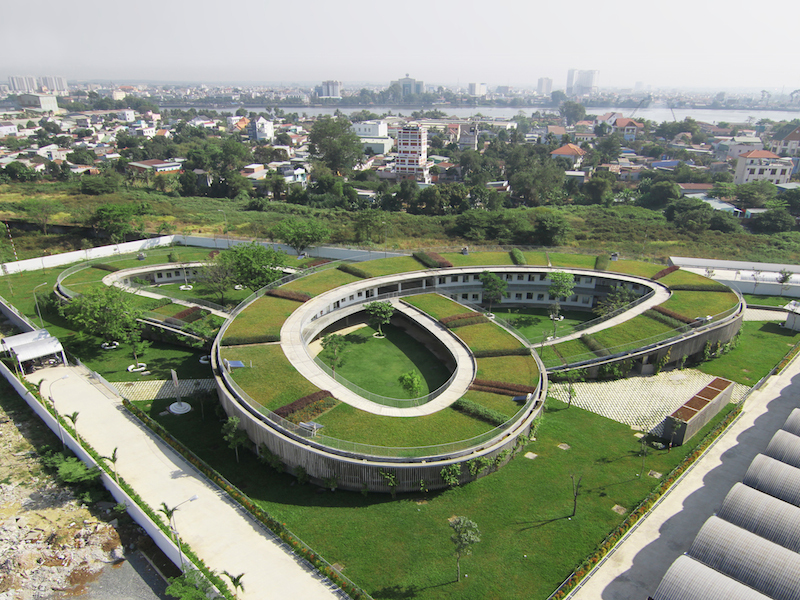 Is Vietnam on the cusp of a green building revolution? The Vietnam Green Building Council (VGBC) has been at the forefront of building green in Vietnam. Originating from California, US, VGBC was established in 2007 and, as a Green City Fund, Inc. program, the nonprofit covers a wide range of categories when it comes to building green in this country. VGBC encompasses infrastructure, development and manufacturing, consumer behavior and even transportation. What lies at its core is raising awareness and advocacy, their Green Building Certification system (also known as LOTUS), along with research and education. Similar to the US Green Building Council’s LEED (Leadership in Energy & Environmental Design) certification program, LOTUS stems from VGBC and applies exclusively to buildings in Vietnam. As the Southern Regional Coordinator and Chairman of VGBC, Melissa Merryweather was brought on during the early stages in 2008 and is a major editor of the LOTUS certification system. She has been a key participant on many green projects in Ho Chi Minh City. “The fact is, if you really start out to design something in a truly sustainable way, you will enhance your own brand quite subtly from the bottom up. And when you give yourself the tools to improve it as well,” says Melissa. Some examples of VGBC LOTUS certified projects includes the Pou Chen Kindergarten (pictured above) located next to a shoe factory in Dong Nai Province. 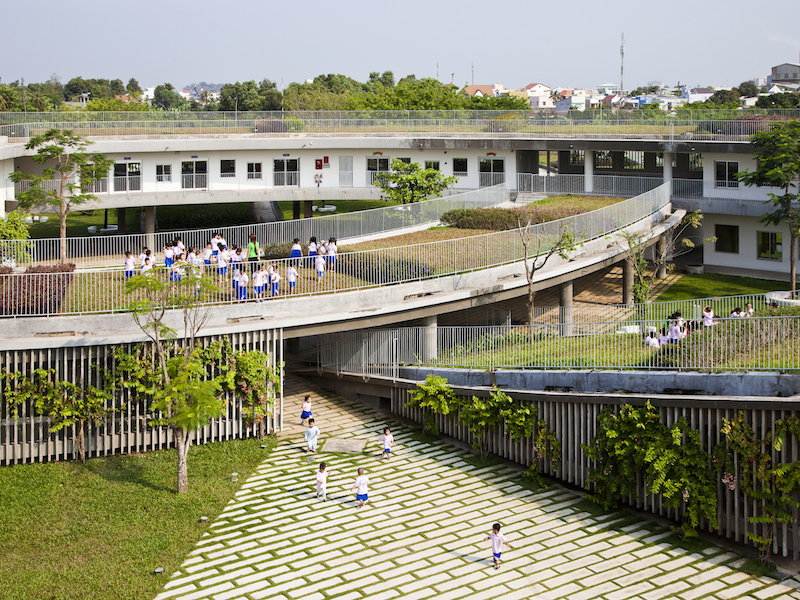 Designed and constructed by Vo Trong Nghia Architects in 2013, this “Farming Kindergarten” accommodates the factory workers’ 500 children. “The client proposed a suitable building for sustainable education for the employees’ children. 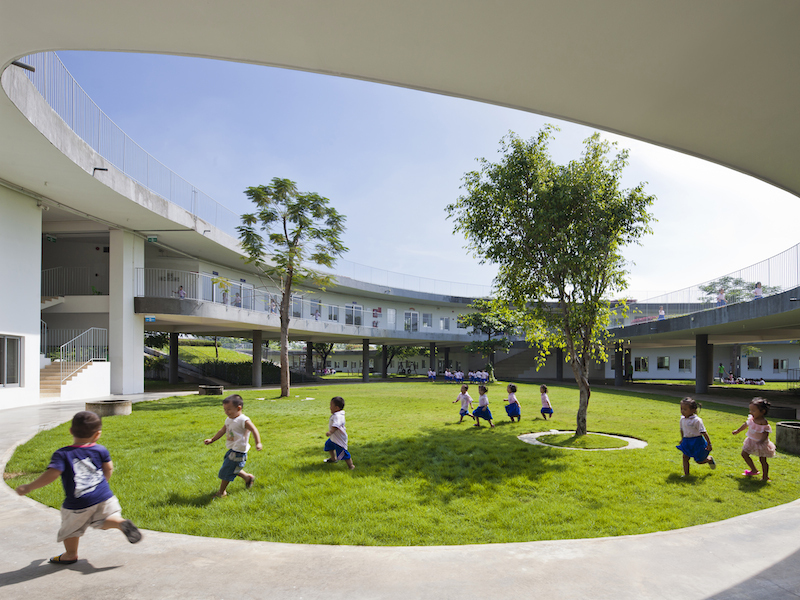 So we built the building as one continuous structure to show the fluidity of the idea of sustainability and to provide a place with lots of landscape for the children to run around and to be more active,” explains Takashi Niwa, a Partner at Vo Trong Nghia Architects. In addition to VGBC, there are green social clubs and groups in Saigon for people to get involved in, for example the Green Drinks social club. Originating from London in 1989, Green Drinks was organized with the intention of bringing environmentally conscious individuals together to discuss, network and bond on all things green. Spreading all over the world, Green Drinks (Facebook: Green Drinks Saigon Lounge) found its way to Saigon in 2009 as the 455th club to open and the first in Vietnam. “We’re really trying to showcase information that is factual and substantial. It’s the substantial end of the sustainability market,” says Melissa, who is also a co-organizer of Green Drinks since its inception. Their next meeting will be on May 7 and will feature Gavin Smith, Director of Clean Development Fund at Dragon Capital, and the topic is Hydropower: The Good, The Bad and The Ugly. “The Vietnamese are looking forward, children are getting an education, and family well-being is really important. So I think sustainability could actually play a major role in the next phase of Vietnam’s development and I think it really has to,” says Melissa. “It’s exciting to see groups like VGBC starting to make an impact.